I thought it was about time I wrote a post about the Gardening Course I’ve been busy with. I signed up for the “Planting Design” Course by Hilary Thomas with My Garden School. The course is a four week online course with lecture notes and video tutorials and students are encouraged to complete an assignment after each weeks learning module. I found the first week very hard going as I was way out of my depth. The module was “Selecting plants based on form, texture and habit”. Whilst I understood everything, the assignment was just too much for me – I couldn’t do it at all. I battled with photographs – nothing looked right, actually everything I put together just looked ridiculous so I gave up on it. I decided to give the second assignment a try before throwing in the towel – and I thoroughly enjoyed doing the two assignments we were given for this week. Perhaps I am a little less out of my depth on these latest two. 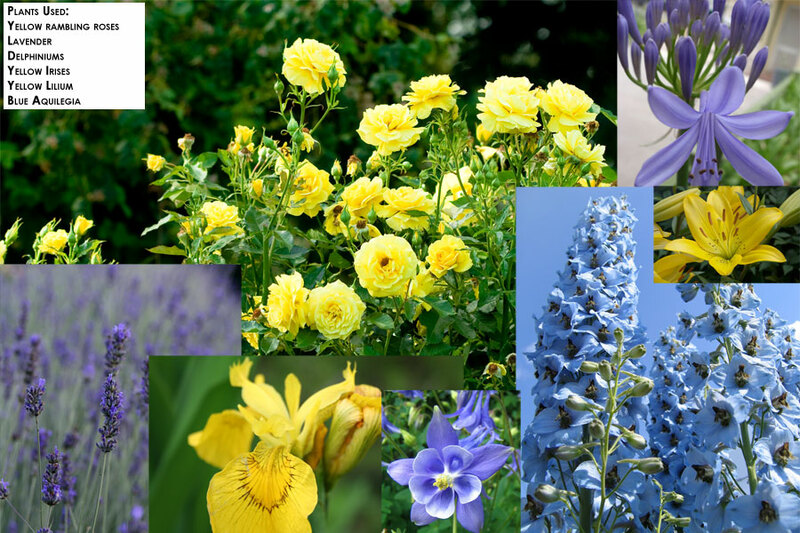 I’ve added them below – I’m pretty sure that seasoned gardeners will find many flaws in my plant groupings and will think they are amateurish, but I promise you, compared to my first attempt (the one I tried to do and gave up on), these are masterpieces and I’m quite proud of them. Once I approached them as something I might actually try in my garden, it seemed to flow quite easily. 1). The second assignment was called Colour (the first photograph above), the brief was: “Using pictures from magazines, catalogues or books design a contrasting colour scheme for Spring interest. Select three plants that have blue / violet flowers and three that have yellow flowers”. Now yellow is not a colour I have in my garden and I battled a little thinking outside of my garden scenario on this one. Finally I just pictured a space and how I might fill it if I was forced to use yellow and blue and … well that’s what I chose. I’m not sure the Iris works with the roses but I thought they looked pretty together. What I really wanted was something small and “breathy”, in yellow. Something like Guara. But they don’t come in yellow as far as I know. Is there any yellow equivalent? What would you suggest? 2). For the first assignment called Contrast and harmony (the second photograph above), the brief was: “Select five plants that are evergreen and would make an interesting group if planted together. 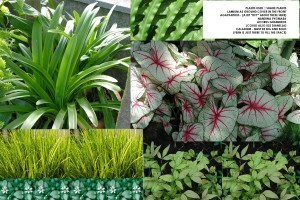 Consider the plants for contrast and harmony of form and texture. Once you have decided on your plants either, draw a simple sketch showing how the plant group will look or use pictures from books or magazines. Name the plants” Once I thought about the plants I have growing in my garden that work well together and that I love, I came up with the grouping of Lamium, Acorus gramineus (variegata) and dwarf nandina pygmaea and though about what I still want to add to this grouping and remembered how much I have been admiring the Caladiums in the gardens of fellow bloggers … and bam! Then my assignment flowed. I had some difficulty finding good photos to use (the whole scale thing throws me – but we were told not to worry about that – just to put them together on the page), and I think it looks quite nice(ish). Lamium and Acorus look gorgeous together in my garden, not as good on the pictures above. I’ve just seen that my next set weeks lecture notes and videos are available. This week we are learning about “The Role of Plants in the Planting Scheme”. I’m looking forward to it. I hope I manage to get through this one. Hi! I’m just about to start planning our garden in the new house. I want to do it myself so I got books… And got so overwhelmed! Taking an online course now sounds interesting! Which one is this, if you don’t mind my asking. One other challenge for me is that I live in the Philippines… I can only grow tropical plants and not really familiar with a lot of plants that only grow in cooler climates. Thanks for sharing! I am inspired! Hi Rica – The course I am doing is through My Garden School – website is here: http://www.my-garden-school.com/. The course I’m doing is called ‘Planting Design’ by Hilary Thomas. She is a well know (in the UK) you can read about her here: http://www.my-garden-school.com/profile/hilary-thomas/. What I liked was thart she took into account that I garden in South Africa (a very different climate to the UK) and she took cogniscence of that fact and helped me accordingly. So you won’t just learn about UK gardening! Its been extremely worthwhile for me! Thanks, Christine. I’ll check out the website. Good luck with the assignments! Looking forward to updates! What a great course. Love that something like this is available online. Living in a smaller centre I don’t have access to courses like this in person so knowing there is online possibilities is really wonderful. The thing I find the hardest about picking flowers to go together is not just the colour and shapes and textures but the seasons. I’ve bought plants before that I thought would be great together only to realize they bloom months apart! Hi Marguerite – I agree. Its not just access in person that would be an issue for me, but the time. I don’t have time to go trotting off to lectures and things and prefer to do it late at night by myself when all is quiet here – so online courses work well for me. I think I might have been a bit ambitious choosing this particular one as a starter and may try another course after this. Fantastic Christine! Your selections are beautiful and it’s always fun to stretch yourself creatively. I’m looking forward to your next assignments. Thanks Cat! I appreciate the support. I’ll post my next assignment next week. Christine – I am really impressed! Taking a course in design with instructor/tutor feedback will push you out of your comfort zone and make you a bold designer. You may think this is super-geeky, but I found that I keep a ‘color wheel’ close at hand when I’m planning for the upcoming seasons. (I sketch it periodically in my garden journal.) It has helped me choose plants that have continuity – like Cheddar Pinks, planted close to Pink Guara and “Wine & Roses” Weigela. The blooms and greens are different, but compliment each other – and the bloom time kind of cascades one into the other. (I’m a little / a lot OCD…) GREAT post! Hi Shyrlene – No, I don’t think its super geeky – I’ve been thinking of getting myself a colour wheel for ages! (ok, maybe we both are a bit geeky then ). I think its a great idea and now I know I’m not the only one, I’m going to get myself one for sure! Well, I was thinking the acorus and caladiums are quite nice. I don’t think I would put them adjacent to each other, but I would put them in the same general area. Perhaps if the caladiums had a lime green coloration to their leaves the combination would work better. Good luck with the rest of the course. It sounds like a lot of fun, and work, to me! Hi Deb – Thats what I thought too – I think you are right, different colour Caladiums would be better. I’m glad you’re sharing, too. I, too, have scores of books on design – interesting to see how this course differs. The best part is – you have interaction – not something you can get from just a book! Hi Holly – and yes, some crit too. I didn’t realise that two of the plants in my scheme clashed until it was pointed out to me – then it became glaring obvious. I now know what to look out for, so I’m finding it very beneficial. Thanks so much for your support! Nest assignment put everything together, all the design elements. then you can call yourself a garden designer. For small, yellow, and breathy (not sure what that means) I though of yellow corydalis, C. lutea. Sounds like a fun course. Carolyn, thats another winner! I looked up yellow corydalis and that is definitely the look I wanted. Small, breathy, sweet … Thank you! Wow….Christine, that all sounds really interesting. I have been thinking of doing one the RHS courses and your post has given me the impetus to have a further look into it. Thanks for sharing the content of your lessons. I have often wondered about formally studying garden design, but reading your assignment definitely made it sound fun! In the mean time, I find that chewing long & slow on gardening books about the great gardens has taught me lots! Volumes, which is appropriate, I suppose. And also for all of your kind comments and visits to WMG – thank you!! thanks for the visit! I love your blog and your garden! small and breathy like gaura but yellow – I have Euryops on my mental shopping list. You would need to choose the species with tiny flowers, not the the ones with large yellow daisies blooming in my garden now. Think of a ‘yellow’ Coleonema. hi Diana, Thanks! yes, Euryops is exactly what I was looking for. I would change the Iris to Euryops, with little yellow flowers because I think this story needs a small floaty flower in it. hmmm, I might even try something like this. I can’t wait for my course. It starts on the 25th of June!!! I think I might sign up for another course too. Oh my goodness, it does look quite complicated. I think you have done a sterling job with your two assignments. Very impressed. Love the flower selection for the colour lesson. I think you will learn a lot with this course. Great!!! You are learning to think like a designer, so hang in there. Scale will most likely be the hardest for you to learn and understand, because I always find clients befuddled by scale and massing. Just try to start really ‘seeing’ and studying plant groupings and try to identify why they are appealing. One you start figuring some of the principles and relate them practically, you will start thinking design as the whole picture, not the parts. Then you will start being a designer. hi Donna – Thanks! I am really learning a lot. I don’t think I’ll ever be a good garden designer, but I will hopefully make fewer mistakes in my garden in future. I’m already looking at plants differently. Amazing really, now I’m starting to understand why some gardens look amazing, and others, although beautifully planted and maintained, look just so-so!